THE CHURCHES of medieval Europe were essentially anonymous. Abbot and artist, builder and craftsman gave of their talents together for the greater glory of God. The Church was His, and there was room in it for all who aspired to work in His name. The results, in parish church as well as great cathedral, remain the chief glories of our cultural heritage, standing also as measure of our loss. With the decline of faith during the Renaissance and the rise of the modern temper, the great church buildings became monuments to an earlier unity, and men created more and more in their own name rather than in His who is the soul of all created things. In this perspective the cathedral-church of Bryn Athyn is unusual among modern structures. You will search in vain among its stones and glass for the signatures of men. To build worthily for the worship of the Lord was the aim; and the means, neglected for centuries, was found in the planning and fashioning of the work on the site, in a harmonious sphere like that of the Middle Ages but infused with the vision of a new revelation of His Word. The Bryn Athyn Cathedral speaks for itself and of God; but because it is uniquely beautiful and historical in our day, its erection is worthy of record in word and picture. Such a record was suggested when the foundations were being laid in 1913, while first departures from modern architectural and building practice were contemplated. Raymond Pitcairn, entrusted with the building of the church, hoped to tell its story. His would have been the fitting hand, having accepted the charge with enthusiasm and carried it through with a rare combination of vision and perseverance. But a life devoted to many pursuits, civic and cultural as well as business, precluded his writing this book. Late in a fruitful career he commissioned the work. Some of its chapters he reviewed in draft; but before it was completed, he died in July 1966. Description: The Bryn Athyn stained glass studio was located in the garden house of Cairnwood, the first home of the Pitcairns in Bryn Athyn. Known as the “glass house,” this building was still functioning as a glass studio for Bryn Athyn Cathedral as late as the 1960s. 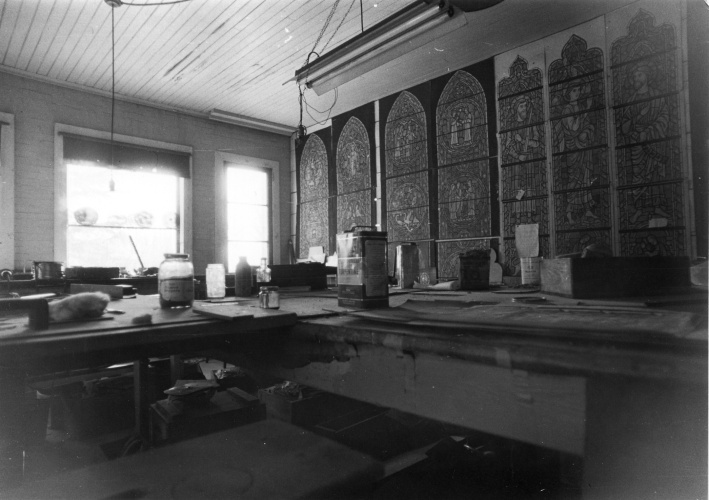 This photograph is from a series of photos taken in the late 1980s, just before the building was renovated as the John and Gertrude Pitcairn Archives. Visitors to the city of Stockholm who find themselves with an hour or two to spare can enjoy a walk in Swedenborg’s old neighborhood, in the city’s Södermalm district. The memory of the Swedish scientist, philosopher and theologian is kept alive in the area thanks to several public monuments in his honor and a street bearing his name. It’s July, and the roses are blooming in Swedenborg’s summerhouse garden at Skansen, an open-air museum in Stockholm, Sweden. The rose garden at Skansen, designed in 1964 by the landscape architect Walter Bauer, was not intended to replicate Swedenborg’s original garden. Nevertheless, with a little imagination Bauer’s formal garden may serve to evoke some sense of the flowery vista that originally led the way to Swedenborg’s summerhouse.